Micro-tunneling—Micro-tunneling has become very popular in Europe and is being used more frequently in the United States. Micro tunneling is the horizontal boring of a large-diameter hole (from 27 inches up to 10 feet) while simultaneously laying pipe. Typically, this technique is used in cities when laying or replacing water and sewer pipe beneath buildings and heavily traveled roads. To prepare for these operations, large-diameter, vertical holes, or “caissons,” are excavated allowing the drilling equipment and hydraulic rams to be set up at the desired depth. The caisson is excavated slightly below the equipment level creating a sump for the returned drilling fluid and associated drilled solids. 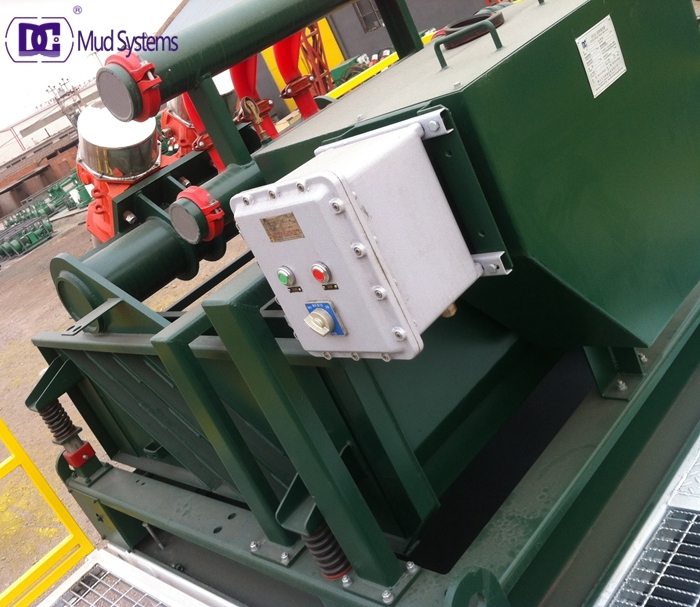 The returns are pumped to the surface by a submersible pump to a compact solids removal system, which typically consists of a shale shaker and mud cleaner mounted over a small tank. DC Solid control shipped 3 sets ZCQ240 vacuum degasser to Pakistan drilling company which is a local government company who had already cooperated with our company for about 3 years. DC Solid control can provide you 4 models vacuum degasser, ZCQ240, ZCQ270, ZCQ300 and ZCQ360. If you have interesting with it, please feel free to contact me soon. 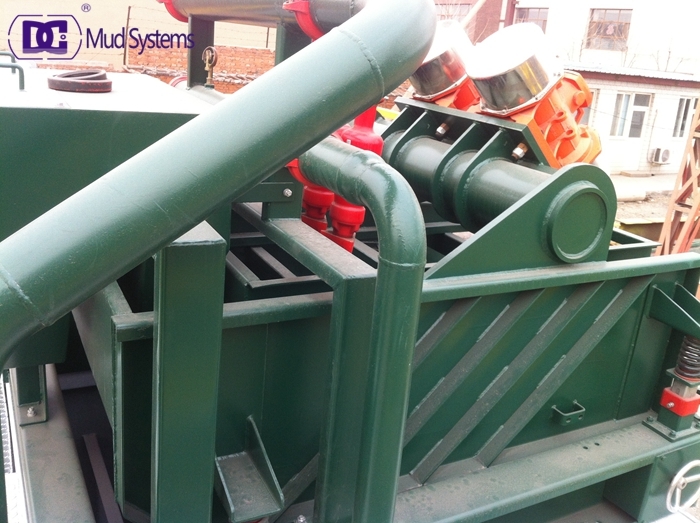 DCJBQ mud agitators are an important part of the mud solids control system. TSC offers a variety of motor and impeller sizes to fit specific tank configurations. The mud Agitator combines compact design with high torque performance levels necessary for a uniformly suspended flow of drilled solids throughout the mud systems. 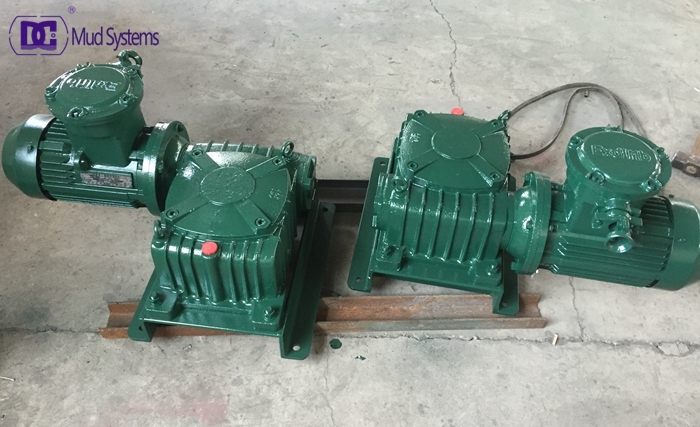 Powered by 1500RPM (4 pole) explosion proof motor and connected through heavy duty gear reducer, this mud agitator transfers high torque at RPM to Impeller to perform the most severe mud mixing conditions. Impellers are available in three types viz. six blade mixed flow turbine type, four blade axial flow type and three blade twisted profile type to achieve highest performance in different site and mud conditions. Gear reducers are worm type or helibevel type depending on the choice of the user. Standard models are available in 20 H.P. & 10 H.P. capacity. 5 H.P. Chemical Mixer with inline gear reducer of 15:1 reduction with stainless steel impeller and impeller shaft is provided along with 5’ X 5’ X 6’ treatment tank is a single unit. 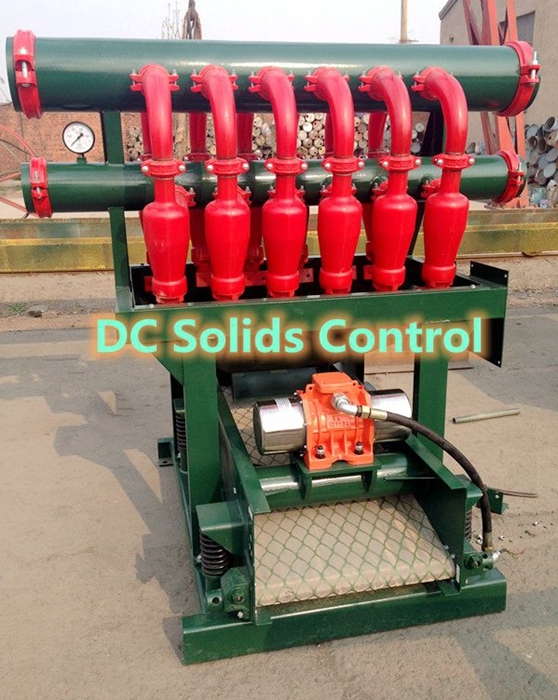 Desilter used in solids control system is the 3rd phase equipment. Desilter is set after desander and prior to decanter centrifuge. The flow rate of desilter separator is decided by cones number. Usually, we utilize 4″ cone for desilter. Each 4″ cone holds capacity 12~15m³/h. 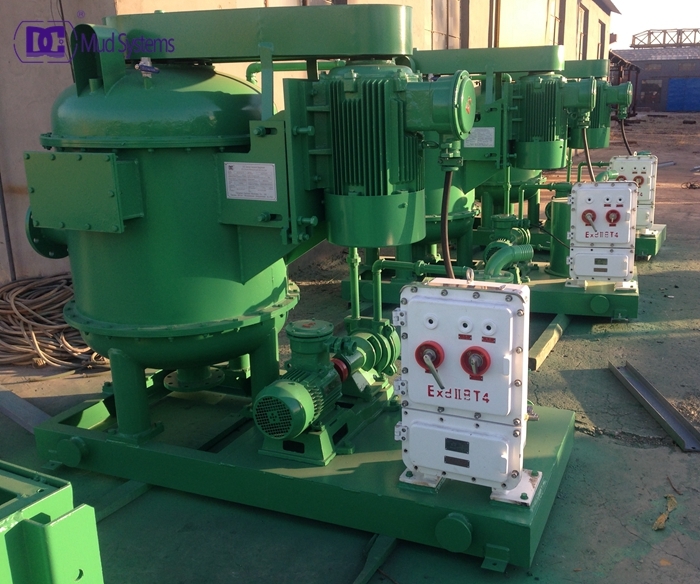 To achieve desilter separation there should be centrifugal pump as cone feeding pump. Under pump transfer power, there will be sufficient pressure pull drilling fluid swirl in cones body. Then solids will be separated out by centrifugal force. Theoretically, desilter will get rid of solids sized over 15 microns. Including fluid feed inlet, fluid discharge pipe, desilter cones, the support frame, bottom shaker or mud chute. The main parts including hydrocyclone, shaker screen, spring, screen motor, and so on. There are thousands of manufacturer all over the globe manufacture solids control equipment. Desilter is one small part of such equipment. 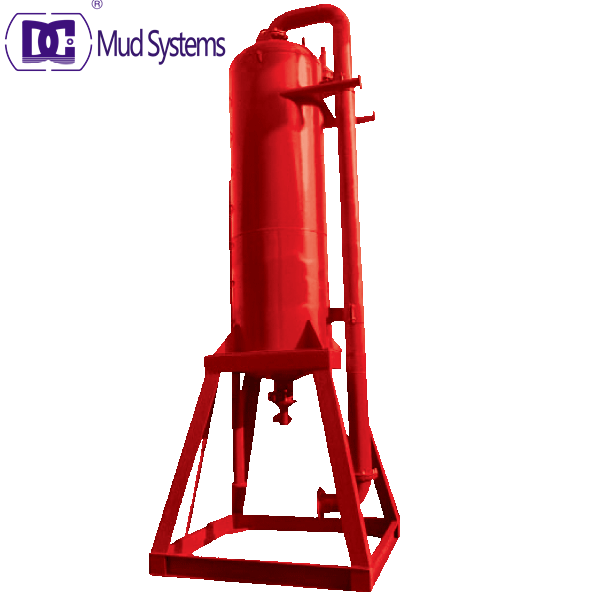 The mud gas separator is designed primarily for the removal of entrained gas, from the drilling fluid. 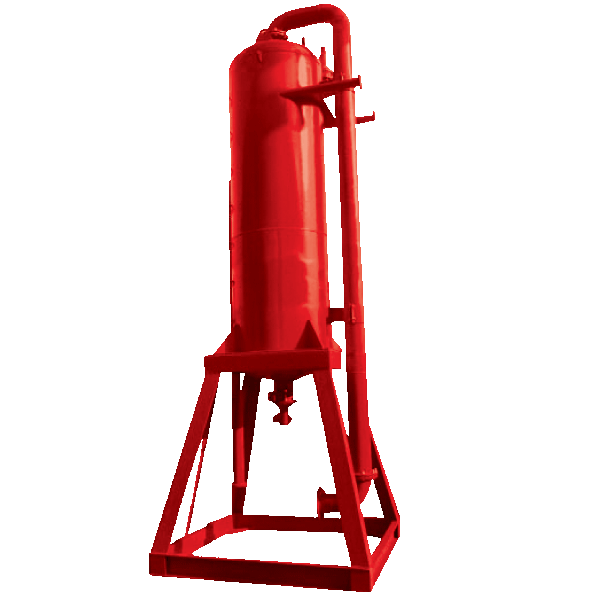 The ZYQ mud gas separator is designed in multiple capacities, to meet specific mud gas needs.